The initial gravitational potential energy of the drop at height h is mgh. On reaching the ground, it has lost its gravitational potential energy but has gained kinetic energy equal to ½ mvT2. The loss of energy because of air resistance is mgh – ½ mvT2. (2) In the above question what is the viscous force when the rain drop moves down with its terminal velocity? When the rain drop moves down with its terminal velocity, the net force acting on it is zero. This means that the weight mg of the rain drop and the viscous force offered by air are equal and opposite. Therefore, the viscous force has magnitude mg and is directed upwards. The following question involves resistive torques in rotational motion. 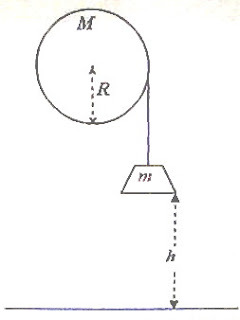 (3) One end of a light inextensible string is tied to a solid cylinder of mass M and radius R. The string is wound round the cylinder many times and a mass m is suspended from the free end of the string so that on releasing the mass, the cylinder rotates about its central axis. There exists an appreciable amount of friction between the cylinder and the axle about which the cylinder rotates. When the mass m which is initially at a height h from the ground (Fig.) is released from rest, it strikes the ground with speed v. How much energy is lost from the system for doing work against friction during the fall of the mass m through the height h? The system acquires kinetic energy at the cost of the gravitational potential energy of the suspended mass m.
[The second term on the right hand side is ½ Iω2 where I is the moment of inertia of the cylinder (MR2/2) and ω is its angular velocity (v/R) when the mass m strikes the ground].